A recent report by international NGO Greenpeace has said that, out of 280 Indian cities for which it obtained data to assess air pollution levels, as many as 228, or 80%, are found to be not complying with the National Ambient Air Quality Standards (NAAQS), as prescribed by the Central Pollution Control Board (CPCB). Defined as µg/m3 – suggesting the concentration of an air pollutant in micrograms (one-millionth of a gram) per cubic meter air – these cities, says the report, do not complying with “the NAAQS standard of 60 µg/m³, as prescribed by CPCB for annual permissible levels.” Notably, the World Health Organization’s annual standards are 20 µg/m³. 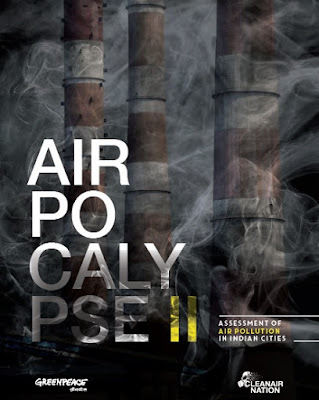 Titled “Airpocalypse II: Assessment of Air Pollution in Indian Cities”, the report, says that Delhi “still remains the top-most polluted city, and is closely followed by many more towns like nearby Faridabad and Bhiwadi and far off Dehradun, Varanasi, and Patna”, all of which are "5 strewn along the fertile and heavily populated Indo-Gangetic basin”. Thus, while for Delhi-NCR a Graded Response Action Plan (GRAP) has come into force, in Lucknow is the only other city which has copied it, but only on paper. “Its implementation still seems to be a distant dream), no other city seems to be taking any action of any worth against the polluters”, the report notes. “This includes 47 million children under 5 years of age, living in areas where the standard is exceeded and 17 million in areas where the air pollution levels are more than twice the stipulated standards”, the report states. 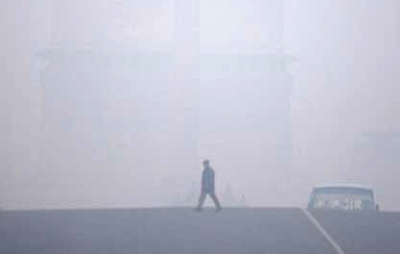 “The largest numbers of people in areas with more than twice the stipulated levels of pollution are in Uttar Pradesh (64 million), followed by Rajasthan (20 million), Maharashtra (19 million), Delhi (17 million) and Bihar (15 million)”, notes the report.